Glasgow moved up to fifth in the Pro12 as they edged to victory over Newport Gwent Dragons in a high-tempo but error-strewn game. 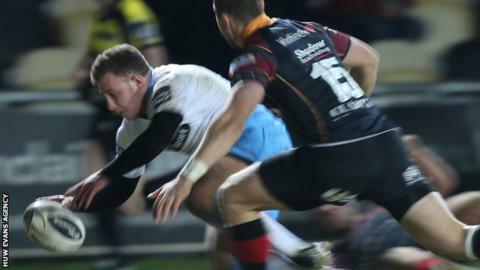 Duncan Weir grabbed the decisive try in the 73rd minute after a break by Josh Strauss, with the fly-half also kicking eight points. Alex Dunbar crossed for the only other try just after the interval. The Dragons were restricted to five penalties from the boot of young fly-half Angus O'Brien. Glasgow went into the game boosted by the release of six players from the Scotland squad, including Weir, captain Strauss and Rob Harley as starters. The Rodney Parade pitch had an unusual look about it with tons of sand deposited on the surface to keep it playable. In the first half O'Brien slotted four penalties against two from Weir, but Glasgow survived the sin-binning of American lock Greg Peterson without conceding. The Dragons found difficulty in piercing the Warriors' defence once they got into the visitors' 22, while the Scots were bedevilled by handling errors in attacking positions. But Glasgow came out stronger after the break and Dunbar crashed over following a rolling maul for Weir's conversion to give them the lead on 43 minutes. O'Brien kicked his fifth penalty to restore a precarious advantage for the Welsh region at 15-13, with both sides missing further shots at goal. Glasgow's bench was able to give the visitors more momentum and with seven minutes left, Strauss's charge into the home 22 saw Weir snap up the inside ball to score, with video referee Paul Adams judging the pass legitimate. That was the last score of the game with Weir named man of the match as Dragons had to settle for a consolation bonus point for the sixth time in eight league games. Newport Gwent Dragons: Carl Meyer, Ashton Hewitt, Adam Hughes, Adam Warren, Nick Scott, Angus O'Brien, Sarel Pretorius; Phil Price, Thomas Rhys Thomas (capt), Brok Harris, Cory Hill, Matthew Screech, Nick Crosswell, Nic Cudd, Lewis Evans. Replacements: Rhys Buckley, Hugh Gustafson, Lloyd Fairbrother, Rynard Landman, James Benjamin, Charlie Davies, Geraint Rhys Jones, Ross Wardle. Glasgow: Peter Murchie; Taqele Naiyaravoro, Glenn Bryce, Alex Dunbar, Rory Hughes; Duncan Weir, Mike Blair; Jerry Yanuyanutawa, Fraser Brown, Sila Puafisi, Greg Peterson, Leone Nakarawa, Rob Harley, Simon Favaro, Josh Strauss (capt). Replacements: James Malcolm, Gordon Reid, Zander Ferguson, James Eddie, Chris Fusaro, Grayson Hart, Fraser Lyle, Lee Jones.